Beat milk, pudding mix and coffee granules with whisk 2 min. Stir in Cool Whip. Spoon half evenly into 6 dessert dishes; drizzle with half the chocolate. Repeat layers. Top each dessert with 1 Lu Crème Roulée Rolled Wafer just before serving. Prepare using skim milk, Jell-0 Vanilla Fat Free Instant Pudding and Cool Whip Light Whipped Topping. 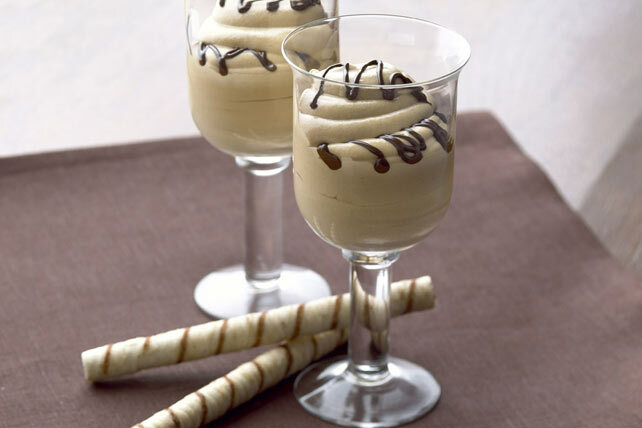 For firmer pudding layers, refrigerate desserts 1 hour before serving.